OpenKJ is cross-platform open source karaoke hosting software licensed under the GPL version 3. It is developed on Linux (fedora, specifically) and built and tested on Linux, MacOS, and Windows. In theory it should build fine on the BSDs as well, but nobody has verified that. 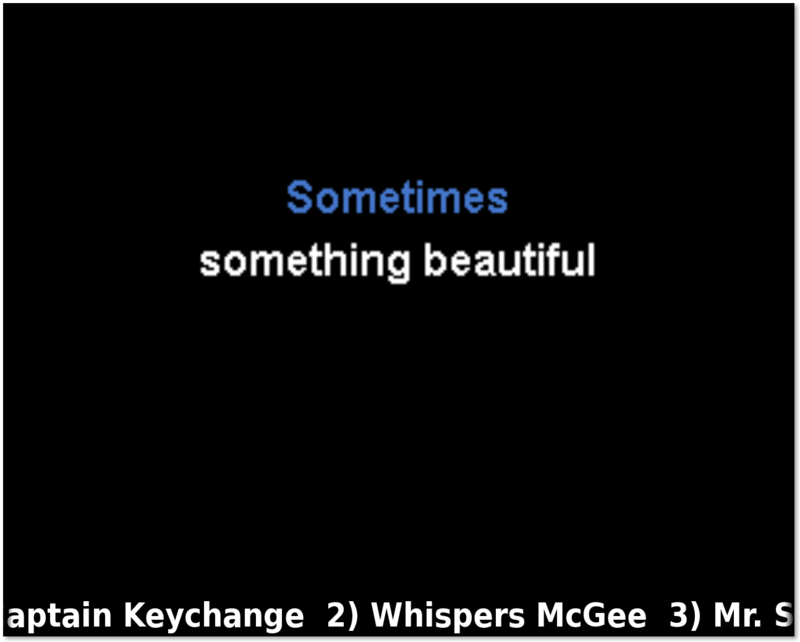 It also now features integration with OpenKJ Songbook for web based search and song submission. This was the application that got the OpenKJ Project started. It was originally created because I wanted to host my shows on Linux but there were no viable hosting applications on that platform at the time. OpenKJ Tools is a collection of tools to help maintain your karaoke library. KaraokeRG - A simple wrapper around the mp3gain program that allows you to easily apply ReplayGain adjustments to your mp3+g zip collection. Zip - Finds any matched pairs of mp3 and cdg files and creates a zip file. Optionally deletes the original cdg and mp3 files after zipping. 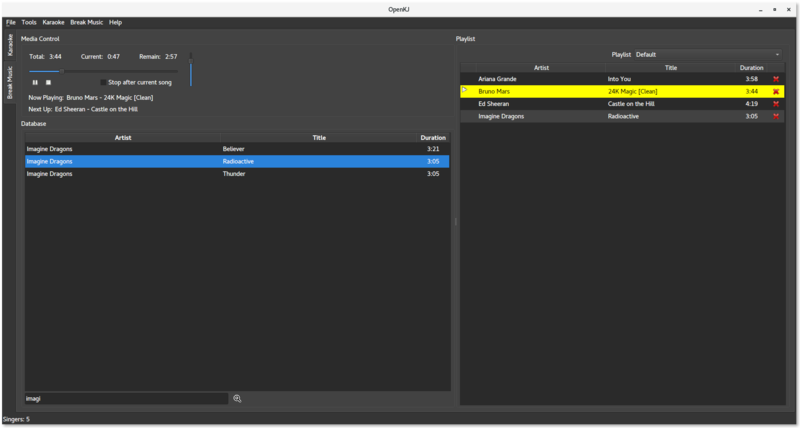 UnZip - Unzips karaoke zip files back into separate mp3 and cdg files. Optionally deletes the zip file after decompression. ZipFix - Finds any karaoke zip files in your library which aren't using non standard DEFLATE64 compression, unzips them using 7zip, and then creates new standard zip files. Useful for fixing compatibility of zip files in your library when older versions of OpenKJ give you "Unsupported Compression Method" errors while importing your library. Also useful for fixing compatibility with any other karaoke hosting software which doesn't support zip64 or deflate64. CaseFix - Renames zip files in your library according to simplified title case (capitalization) format. Note that there are some artist names and song titles that intentionally do not follow this standard. This tool is not aware of many of them. If your library's capitalization is currently a mess, this tool can make it better. If your library is in pretty good shape, capitalization wise, this tool could make things worse. This software is currently experimental. It should work fine, but make sure you have a backup of your library before using it. 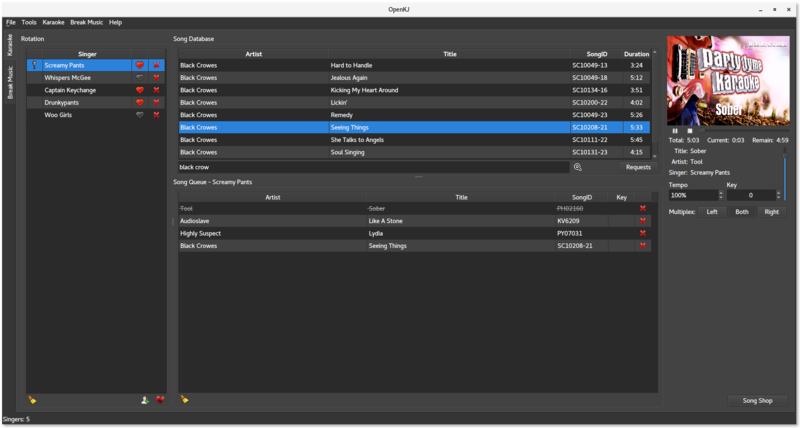 OpenKJ Songshop is a tool for purchasing and downloading karaoke files on the fly. Currently only PartyTyme is available, but I am open to working with any other karaoke manufacturers who are interested in being included.